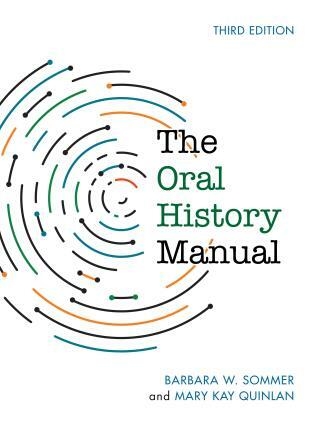 The Oral History Manual is designed to help anyone interested in doing oral history research to think like an oral historian. Recognizing that oral history is a research methodology, the authors define oral history and then discuss the methodology in the context of the oral history life cycle – the guiding steps that take a practitioner from idea through access/use. They examine how to articulate the purpose of an interview, determine legal and ethical parameters, identify narrators and interviewers, choose equipment, develop budgets and record-keeping systems, prepare for and record interviews, care for interview materials, and use the interview information. In this third edition, in addition to new information on methodology, memory, technology, and legal options incorporated into each chapter, a completely new chapter provides guidelines on how to analyze interview content for effective use of oral history interview information. The Oral History Manual provides an updated and expanded road map and a solid introduction to oral history for all oral history practitioners, from students to community and public historians. Every oral historian’s library should start with a good “ manual ” of the how-to variety. A manual can be essential to turn our ideas into a concrete oral history project, with tips on developing a mission statement, choosing and protecting narrators, suggested forms to keep the oral history organized, and what to do about archiving when the histories have been collected. One particularly valuable contribution of a good manual is helping to safeguard and disseminate the efforts of the Oral History Association (OHA) to establish professional standards and protocols. As new issues arise, it is necessary to revise the ways oral history is recorded, preserved, and used. I mention this because guidelines are essential to establish and maintain a professional and ethical standard for oral history, whether it is for a library project, a historical society, a classroom, a community, or an indigenous or ethnic culture. Recently, two very good manuals that refl ect all these objectives have become available, both sharing the considerable oral history experience of veteran manual writers, Barbara Sommer and Mary Kay Quinlan, and one introducing a new name. The Oral History Manual was first published in 2002 by Barbara Sommer and Mary Kay Quinlan. Immediately, classrooms and communities adopted it as a clear and concise discussion of the process of oral history. It has become the standard manual for most community and academic oral history projects. However, the challenges of a rapidly changing world of digital communication have brought forward a revised second edition even before the decade had ended. Newcomers to oral history and old-hand interviewers alike should beware of venturing forth without first confirming their plans and techniques through a careful reading of the new edition of this standard reference. Despite its unprepossessing cover, this manual, by two experienced US oral historians, is one of the best recent concise guides to the oral history process. It is aimed firmly at the US market and as such reflects very few of the important issues emerging from the international movement (for example around identity, narrative genre and traumatic remembering), but nonetheless it contains a great deal of sensible advice to those new to oral history. The manual reiterates the mantra of good oral history practice that has become so familiar from other guides around the world over the past twenty years. There is very little here that experienced oral historians would now disagree with, which is perhaps a reflection of the way in which the globalisation of oral history method- ology has led to a broadly agreed set of standards. And if the authors have disappointingly little to say about the role of gender and ethnicity in the interviewing process, they have very effectively marshalled good solid advice in a very clear and readable manner. Their project planning guidelines are realistic and sensible; there is a succinct consideration of copyright and ethics, including some useful thoughts on the implications of web access; advice on equipment is well- researched and suitably cautious; and there is a helpful section on budgeting and finance, something rarely tackled by other manuals. More bravely the authors have put forward job descrip- tions for the ‘good interviewer’ and the ‘good transcriber’ (and even for the ‘good narrator’! ), with which some might quibble but nonetheless provoke discussion. Whilst they don’t devote a great deal of attention to the thornier debates around memory and narrative, there is enough here on the need for both narration and reflection within an analytical framework to alert newcomers to the issues. Simi- larly their emphasis on ‘traditional’ one-to-one interviewing allows little room for considering non-standard interviewing formats, such as group or retro-chronological interviews, but they still provide good advice on inter- viewing techniques. Bullets, sub-head- ings and boxed text makes it easy to navigate through the volume. Its large format allows the reproduction of full- size documentation forms, but the publisher/printer has done no favours with the photographs – many of them full-page – which are grey and indis- tinct throughout. For all the manual’s merits there is a slightly old-fashioned feel about it. It is possible that some projects and researchers (even in the US) still don’t have access to personal computers but many do and for them the authors Autumn 2003 ORAL HISTORY 91don’t really get to grips with word- processed and electronic – rather than handwritten – documentation. Or indeed with catalogue databases. Establishing a computer-based docu- mentation strategy at the outset is surely vital for any project and pays dividends later. I would have liked the authors to have applied their step-by- step good sense to grounded advice about these issues, at both the start-up phase and after the interview at cata- loguing and data-sorting stage. Similarly although the chapter on recording technology admirably includes an excellent section on video interviewing (so often missing from oral history manuals), it has little to say about the newer flashcard-based recorders, mass storage systems and other ‘virtual’ media which are currently dominating discussion amongst oral historians. And some basic advice on pc-based editing pack- ages would have been welcome. One final disappointment is the bibliography which might have been more comprehensive in its coverage and perhaps have offered some exam- ples of research-based oral history work in the US. But if this manual is used alongside Don Ritchie’s Doing Oral History (to which the authors give due credit), Paul Thompson’s The Voice of the Past, perhaps The Oral History Reader, and with an eye on the H-Oralhist email discussion list, any beginner to oral history will be extremely well-equipped to carry out an oral history programme of quality and lasting value. In the seven intervening years between the first edition and this second edition of The Oral History Manual, major changes have been made in the technological requirements for recording oral history, subsequent processing and archiving, and access to recordings; these changes have been reflected in the second edition of the Manual. Published in hardback in 2009, the authors of the Manual aim to provide an updated section on oral history recording equipment and on ‘processing oral history materials’; an expanded discussion of project budgeting; more information on legal and ethical considerations, particularly issues that affect oral history in academic settings (there is detailed information on American Institutional Review Boards for example); and a discussion of cross- cultural interviewing considerations. Although there are many books on oral history theory and interviewing, this is one of only a handful of ‘how to’ manuals (alongside Donald A. Ritchie’s Doing Oral History) for those new to oral history who want specific guidance on undertaking an oral history project, from project proposal to archive. The authors certainly achieve their aim to ‘guide readers through the entire process of “doing” oral history’. They employ both a step-by-step, and a question and answer approach, from what to think about when planning a project, recruiting staff, purchasing equipment, probable ethical issues, how to prepare for interviews, and post-interview processing and documentation. The authors’ advice is very practical, particularly in the ‘Planning and Budgeting’ section, which sets out clear information on setting a mission statement and establishing a project timeframe. The authors have done a good job on the expanded funding section, and give sensible advice on developing a project budget, identifying ‘one-time costs’, ‘overhead costs’ and ‘interview costs’ and advice on seeking financial support and funding. I am particularly pleased that the authors stress the importance of planning record-keeping systems and documentation procedures before the project begins; in addition, in both the ‘Planning and Budgeting’ and ‘Processing’ chapters they place great importance on working with suitable repository in which to archive material. In an expanded chapter on ‘Recording Technology’ the authors give equal time to both audio and video oral history, but do give very sensible advice, and warnings, to those thinking of using only video in a project. This chapter, the largest in this second edition of the Manual, has also been updated to provide specific advice on digital recording file formats. The authors give good, clear information on different file formats and on the importance of recording specifications – although they could perhaps be more forceful in recommending that oral historians record in formats that use ‘lossless’ compression (for example, WAV) rather than ‘lossy’ formats (for example, MP3). Pleasingly, the Manual also urges readers to think about access to their oral history inter- views once recorded and gives adequate warnings about the importance of storage and the back-up of digital files, with the sensible advice to check with local archives and Oral History organisations to obtain up-to- date advice. Chapter 4 on ‘Legal and Ethical Considerations’, has been slightly expanded with a discussion of Institutional Review Boards (or Ethics Committees to UK readers), although the rest of the chapter remains mainly unchanged except for a slight alteration to the discussion around the ethics of internet access to oral history. The chapter is incredibly thorough, and details the possible ethical aspects of every stage in a project, from ethical considerations in interview preparation, through to ethical issues and equipment. Aside from this main chapter, the inclusion of the ‘Principles and Standards of the Oral History Association’ in Appendix A are incredibly useful, and provide further guidance for readers on their responsibilities to interviewees, the public and the profession. The Manual is clearly aimed at those new to oral history and could be used as a ‘one-stop shop’ for anyone embarking on an oral history project – even if readers do not read the entire manual (which is not a troublesome read at around eighty pages) the ‘Oral History Evaluation Guidelines’ in Appendix В would provide a useful check-list. The addition of sample forms relevant to oral history projects is welcome, particularly the sample forms for Volunteer and Transcriber Agreements, Interviewee Biographical Information form and Interview Information Form. The Donor Release Form is also useful for US readers, but less so for those in the UK who should seek further advice from UK archives and the OHS. Although the Manual is aimed at newcomers, I think that the authors could expand on the advice they give without overwhelming any readers. To echo some of the suggestions made by Rob Perks in the review of the first edition ( Oral History vol 31, no 2, Autumn 2003) – the Manual is still very US-focused (it is part of the ‘American Association for State and the Oral History Manual second edition Barbara W. Sommer and Mary Kay Quinlan Local History’ series after all). As such, some aspects of the book may feel a little alien to a UK audience. This is manifest through different vocabulary (for example, ‘recording abstract’ rather than ‘summary’, ‘master log form’ etc) but also a significant difference is seen in the authors’ discussion of legal and ethical considerations in chapter 4. Although the overarching principles and discussions in the chapter will be useful to those in the UK the authors should advise international readers that further guidance should be sought on copyright situations in other countries. There is also a very strong emphasis on the importance of transcription, something that, certainly in the UK, is seen as more of a luxury and as a mixed-blessing, with the summary (or abstract) seen as the most important guide to recordings. Although the authors do give good advice on digital file formats it some- times feels as though this aspect is included as an afterthought; for example, there is sometimes some clumsy editing, such as the advice to use a ‘watch with a second hand’ to get time- codes when summarising digital files. And although the ‘Planning and Budgeting’ and ‘Processing’ chapters give good advice on record-keeping systems and documentation procedures no advice is given on the importance of unique filenames for digital files or on the significance of maintaining the integrity of digital files. The authors could still improve on the number of further resources they suggest – their own reading appears to be very US focused, with their bibliography including few resources from outside the US and the ‘selected sources’ in appendix С are similarly US-focused. In addition, their bibliography features only ‘oral history’ and ‘archival’ literature – 1 think that readers of the Manual, no matter if they are new to oral history or not, would bene- fit from advice on further reading that contextualises oral history theory, methodology and recommends reading on other relevant fields of study, such as Memory Studies and Public History, and even on Digital Curation and Preservation – which should surely be of prime importance to anyone under- taking oral history, within an academic or community setting?